Desperate to find a new home amongst the stars, the last remnants of the human race are cast out into deep space. Thousands upon thousands asleep aboard a colossal colony ship, hibernating until a habitable planet is located. Eventually they discover a world which was terraformed by humanity long ago in an age before Earths civilisations fell to ruin. Abandoned by the original terraformers, this new planet isn't the unoccupied Eden they had hoped for and is populated by two forces who fight for power and territory. Adrian Tchaikovsky has already proved adept at writing fantasy, not least with his ten volume Shadows of the Apt series but also with his recent novel Guns of the Dawn. Until now however he hadn't turned his hand to writing science fiction novels. It is a move I'm glad he made as Children of Time is not only a rewarding, memorable novel but one that can take its place amongst the finest science fiction. In style it has elements that remind me of Stephen Baxter — the depiction of non-human protagonists and the epic span of years in particular. There is that same sense of wonder and immersion — being carried along on an alien world with hosts both familiar and strange at the same time. The novel also has the grand vision that is a characteristic of a Peter Hamilton's space opera. It's a combination that works perfectly, avoiding the trap that Baxter sometimes falls into with the story becoming dry and sterile, yet still managing to describe the evolutionary steps of earth-like creatures in a realistic fashion. Its clear the author has a fondness for insects, Shadows of the Apt had human caste's who were named by and had some characteristics of insects. In Children of Time it's the order Araneae and family Formicidae that are the insectile focus. The way that future technology is described is both modern and creative, I loved the way the story moves from the future that is recognisably still our own (even if it is one with terraforming, space ships and bio-engineering) to a far distant one where even our language is only recognised by historians (known as Classicists). This distant view of our culture and society, while a small part in a much larger story, really strikes a chord. It's the way that the uplifted race of creatures are described that sets the book apart though, the juxtaposition between human and non-human is both reflective and distinct. Children of Time Explores themes of religion, evolution, sexism and the nature of humanity along with what it takes for a species to call something "God". The book also provides an effective example on just how evolution can work and just what makes one species superior to another. It's a mind-blast, thought provoking story just full to the brim with ideas. 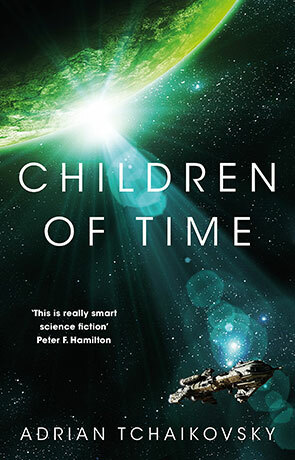 Children of Time has that essence of the classic science fiction novels, that sense of wonder and unfettered imagination but combined with this is the charm of a writer who really knows how to entertain, how to spin a good story. Essential science fiction, a book not to be missed. Written on 8th June 2015 by Ant.